The Jerusalem cross, also known as Crusaders' cross, is an heraldic cross or Christian symbol consisting of a large Greek cross surrounded by four smaller Greek crosses, one in each quadrant. 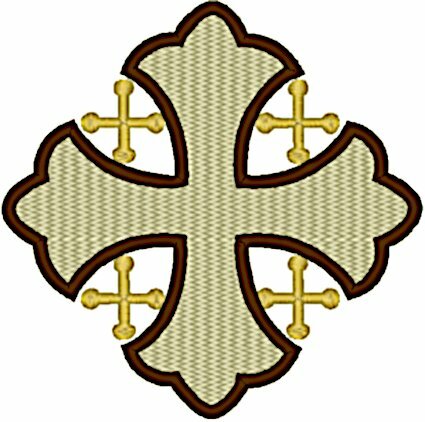 The simpler form of the cross is known as the "Crusaders' Cross", because it was on the papal banner given to the Crusaders by Pope Urban II for the First Crusade, and was a symbol of the Latin Kingdom of Jerusalem. The four smaller crosses are said to symbolize either the four books of the Gospel or the four directions in which the Word of Christ spread from Jerusalem. Alternately, all five crosses can symbolize the five wounds of Christ during the Passion. This design is available for the 4" x 4", 5" x 7", and 7.75" x 11.75" hoops. The sewn out size for the 4" x 4" hoop is 2.55" W x 2.54" H with 5,842 stitches. The sewn out size for the 5" x 7" hoop is 4.94" W x 4.92" H with 16,939 stitches. The sewn out size for the 7.75" x 11.75" hoop is 7.68" W x 7.65" H with 37,524 stitches. This design has 3 thread colors. Click here for information about embroidery design selection and placement on communion linens.